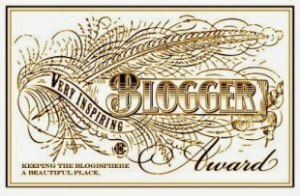 I am very pleased to have been nominated for another Very Inspiring Blogger Award. Big thanks to Kathy, whose stories I always enjoy reading. Ok so now for the rules which I am going to bend slightly! 1. The nominee shall display the Very Inspiring Blogger Award logo on her/his blog, and link back to the blogger who nominated them. 2. The nominee shall nominate fifteen bloggers she/he admires by linking to their blogs and informing them about it. (I am crazy busy at the moment so am going to nominate three blogs. Quality not quantity as the wise old saying goes). 3. The blogger shall list three things that inspired her/him this week. 1. A lady I had the pleasure of meeting on Wednesday. She is in her 60’s, terminally ill, housebound and one of the most positive people I have ever met. She contacted me to ask if I would go to her home to teach her mindfulness. She had been reading a lot about it and was curious. I had heard her backstory before I went and aside from her ill health this lady has been through a LOT. I feel grateful to have had the privilege to meet her. Although I am teaching her mindfulness over the next few weeks I have a feeling she will be teaching me far more about living. To retain dignity, hope and a sense of curiosity in such difficult circumstances was really inspirational to me. Having a disability I do try to always focus on the things I can do, rather than the things I can’t and this morning was a great reminder that you are never too old, sick or immobile to seek out a new experience and find some joy in life. 2. My eight year old son. He has decided he has finished writing his first book. There has been no angst over word count or concerns that it is only, in fact, two pages long. He has already picked a subject for his second. ‘Wow.’ I told him. ‘You’re so fast. I’m still only a third of a way through writing my first novel.’ ‘Why don’t you just sit down and finish it then Mummy?’ Why indeed. 3. My sixteen year old son has gone back to school this week to start studying for his A’Levels as well as starting his first ever part-time job. He is working long hours but is fiercely determined to create the future he wants. I am very proud of him. My first nominee is Linda. Not only do I find her blog uplifting and interesting she has created a great challenge in the form of Stream of Consciousness Saturday. It’s really liberating to be able to write the first thing that comes into my head following a prompt and not have to worry about editing. My second nominee is K.Z.. An awesome indie writer, her stories never fail to make me gasp. She has just self-published her first book, 100 nightmares. Don’t read it just before bed! My last nomination is Lore, a natural storyteller who weaves together words so beautifully I often have a lump in my throat reading them. Thanks so much to Ronovan for nominating me for the Very Inspiring Blogger Award. As I only created this blog a few weeks ago it is touching to receive such an accolade from the most inspiring blogger I know. 1.Thank and link to the amazing person who nominated you. 2.List the rules and display the award. 3.Share seven facts about yourself. 4.Nominate up to 15 other amazing blogs and comment on their posts to let them know they have been nominated. 5.Proudly display the award logo on your blog and follow the blogger who nominated you. 1) On my first every CV I put ‘fluent in German,’ thinking it would help me sound more intelligent. I got the job I went for not realising the Head Office was based in Germany. Yep I lasted as long as my first conference call. My basic grasp of the language was excruciating. (in my defence I did pass my German GCSE exam). Honesty is always the best policy for me nowadays. 2) I meditate every single day. I studied mindfulness after acquiring a disability whilst exploring ways to cope with chronic pain. It changed my life so much I completed teacher training and am now a mindfulness coach. 3) I love orange smarties. So much so when my son was young he would always pick them out of his tube and hand them to me. One day I filled a tube solely with orange smarties to see what he would do. He handed them all over one-by-one with a rather shocked expression on his face (and I handed them back with a million kisses and tears in my eyes). 4) Last year I eloped to Gretna Green without telling a soul (apart from my children). Well obviously my husband knew. We had an awesome day and I wouldn’t change a thing. I created a wedding blog you can view here. 5) I was lucky enough to gain a place on the WoMentoring Project. My mentor is the fabulous Louise Walters. I never dreamt I could write (anything) and am so grateful of the project for giving me the confidence to try. 6) I read ALL the time. When I finish a book I have become really emotionally engaged in I carry out a period of silence and then don’t start another one for a couple of days as a mark of respect. 7) I practice gratitude daily. My journal is the last thing I do at night. Rather than dwell on the things I have lost or can’t do anymore I choose to look for the positives in everything. There is always, always, always something to be thankful for. WordPress is teaming with inspiring bloggers but I have managed to pick some from the ones I follow from either my Fabricating Fiction blog or my Happy Starfish blog. 1) Stepping out of pain – As a sufferer of chronic pain I know there is a myriad of negative information readily available via google. People readily share how bad their condition is, how they will never get better, how nothing helps. It is lovely to read positive and inspiring posts with practical ideas that can help alleviate symptoms of chronic conditions. 2) The call of the pen – Lyn will probably shy away from this award but she is so encouraging of new writers and a fountain of knowledge, I couldn’t not include her. 3) Healing your grief – ‘How to work through the journey of grief after losing a child.’ Karen is such an inspiration, full of positivity and her posts are always beautifully written. 4) No one gets flowers for chronic pain – a touchingly honest account of life with pain, the good, the bad, the highs and the lows. Inspiring for other sufferers to know they are not alone (me included)! 5) Artfully Inspiring – Not only is Adelie a fantastic writer she is also a beautiful human being. Check out her about me page. A big thanks to Emma for nominating my new blog for The Liebster Award. 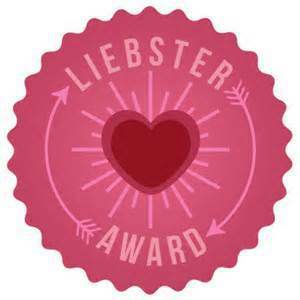 When you are given The Liebster Award, you, in turn, pass it on to 11 blogs you enjoy (either new blogs or blogs with less than 200 followers) after posting 11 facts about yourself, answering 11 questions from the person who nominated you, and asking the blogs you wish to nominate 11 questions. 1. I never watch the news or read newspapers. The world inside my head is much nicer than the one outside. 2. I regularly make my own chocolate (the healthy kind). 3. I used to want to marry Noel Edmonds (hey, I was only 10). 4. I am lucky enough to have the awesome Louise Walters as my Mentor through The WoMentoring Project. 5. I am learning to play the piano and guitar. 6. I love to laugh and try to find humour in everything. 7. I eloped to Gretna Green last year without telling anyone (oh, my future husband knew). 9. I rarely watch TV but love a good movie. 10. I am never without a book. 11. My singing voice is so bad my children beg me to stop! (Hey I enjoy it). 1. What is the best piece of advice you have ever received? The only thing in life we can control is our attention, where we put it and how we choose to react to situations. It’s why I now teach Mindfulness. 2. Who is the first person you pick up the phone to when you need to talk? My husband, I am lucky enough to have married my best friend. 3. Plane, train, or automobile – what is your favourite way to travel? It always was my own 2 feet but after being left with a disability a few years ago I am grateful to go anywhere, by any means! It will be ok in the end, if it’s not ok, it’s not the end. Definitely country. I moved to a town from a village when I got married and miss the open spaces. 6. What book would you take with you to a desert island? Probably one called “How to survive on a desert island”. 7. What superhero would you be and why? Probably catwoman (because she looks hot). 8. What is your favourite decade and why? The 80’s. Full of gigs and fun. 9. What one thing would you do to change the world? Teach meditation to everyone, if we all experienced inner peace the world would be a far nicer place to be. 10. What would you save if your house was on fire? 11. What makes you laugh, what makes you cry? My children make me laugh every single day. People being unkind to others make me cry. And onions. 1. If you could add one thing to the school curriculum what would it be? 2. Do you write in silence or to music? 3. What is your earliest memory? 4. Do you have a pet? 5. What one piece of advice do you love to share? 6. Name something you haven’t achieved yet but would like to. 7. What’s your favourite movie? 8. Do you have a blogging schedule? 9. What’s your favourite smell? 10. Which genre of books do you prefer? 11. Name something (or someone) that makes you smile.